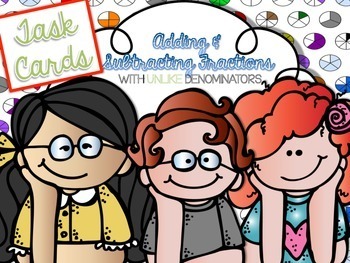 Do your students need help adding and subtracting fractions with unlike denominators? These task cards will give them extra practice! There are 28 cards with a sheet to record their answers and an answer key! Task cards are great for students because they're not intimidating and students can work at their own pace! The students just grab a card when they have time, take it to their work area, solve and then trade out for a new card.